Aquaculture is the science, art, or practice of cultivating and harvesting aquatic organisms, including fish, mollusks, crustaceans, aquatic plants, and algae such as seaweed. Operating in marine, brackish, and freshwater environments, aquaculture provides food for people and in smaller amounts supplies fish for stocking lakes, bait for fishing, and live specimens for home aquariums. Aquacultural practices span a great range from poor farmers with a few carp in a pond in China to commercial growers raising millions of shrimp on the mangrove coasts of Indonesia or millions of salmon in net cages in Norwegian fiords. Mariculture, or marine aquaculture, is the subset of aquaculture specifically related to all forms of marine organisms, including finfish, shellfish and marine plants. The term "fish farming" is often used synonymously with aquaculture. In popular use, the term fish, when used for food, generally conveys more than the taxonomic grouping of fish, extending to invertebrates such as lobsters, crabs, shellfish, and so forth. The term "fishery" has similar broad applications. Some individuals, however, consider fish farming as a subset of aquaculture, limiting it to fish or to particular technologies. China is by far the largest producer of aquacultural products, accounting in 2004 for nearly 70 percent of the worldwide aquacultural output, with the rest of the Asia and Pacific region accounting for another 22 percent of the production, and the remaining 8 percent being distributed between Europe, Africa, the Middle East, and North and South America. In China, the cyprinids (including carp) are the dominant farmed fish, while in Western Europe the salmonids (including Atlantic salmon) hold that position, and in North America the dominant aquacultural product is the catfish. Aquaculture is in a period of rapid expansion as diverse people and nations turn to it as a means of alleviating world hunger and providing food and a cash crop for families. Aquaculture offers the promise of fostering a food production system that is ecologically sustainable and able to alleviate stresses on wild populations of aquatic organisms; but realizing that promise remains difficult. 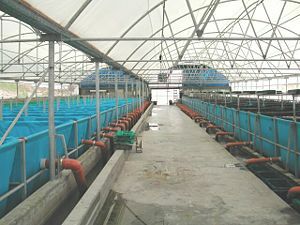 A biosecure koi breeding and growing facility in Israel. 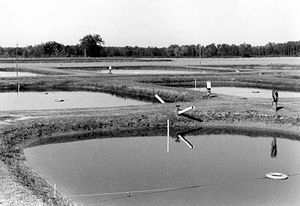 A research and demonstration aquaculture facility in Florida. Whatever the context, the rapid expansion of aquacultural activities tends to follow a first course of pursuing the greatest productivity at the lowest cost while relying on the free use of such environmental goods and services as wild fish (to make fish meal) and water currents (to flush away wastes). Practiced in this way, aquaculture, which is a critical component of the global food supply system, may be neither sustainable nor a benefit to wild populations. Fortunately considerable progress in developing and applying sustainable aquacultural techniques has already been made and much that has been learned is transferable. Efforts to move commercial aquacultural facilities toward sustainability are being undertaken both by regulatory agencies and by the growers themselves. The practice of aquaculture is ancient and found in many cultures. Aquaculture was used in China circa 3500 B.C.E.. When the waters lowered after river floods, some fishes, namely carp, were held in artificial lakes. Their brood were later fed using nymphs and feces from silkworms used for silk production. The oldest known document on fish culture was written by a Chinese politician, Fan-Li, in 475 B.C.E. (Parker 1995). 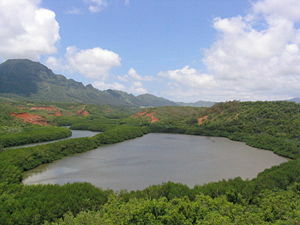 Alekoko "Menehune" fishpond on the island of Kauai. The Hawaiian people practiced aquaculture by constructing fish ponds, with an organized system in place by 400 C.E.. A remarkable example from ancient Hawaii is the Menehune fish pond thought to date from at least one thousand years ago, at Alekoko on Kauai. According to legend, it was constructed in one night by the little people called Menehune. Egypt, Europe and the Americas also have a long history of aquaculture. There is evidence of Egyptian aquaculture, focusing on tilapia, tracing to 2000 B.C.E.B.C.E., while Roman aquaculture was practiced in the first century B.C.E., according to Pliny the Elder (Parker 1995). The Romans focused on trout and mullet and were quite adept at breeding fish in ponds. In Central Europe, there is record of pond fish culture at the end of the eleventh century. In Europe during the Middle Ages, aquaculture became common in monasteries, as fish was scarce and thus expensive. A fourteenth century French monk, Dom Pinchon, may have been the first person to artificially fertilize trout eggs (Parker 1995). There is also evidence that the Maya practiced a form of aquaculture, as did the native peoples of North America. Transportation improvements in the nineteenth century made wild fish caught by fishermen easily available and inexpensive, even far from the sea, causing a decline in aquaculture. If China is considered the cradle of aquaculture, then perhaps France is the birthplace of modern aquaculture, with the first fish hatchery having been established there in 1852 (Parker 1995). The current boom in aquaculture started in the 1960s as prices for fish began to climb. Wild fish capture was reaching its peak and the human population was continuing to rise. Today, commercial aquaculture exists on an unprecedented, massive scale. In the 1980s, open-net cage salmon farming was also expanding; this particular type of aquaculture technology is still a minor part of the production of farmed finfish worldwide (about 7 percent by weight in 2004). However, evidence of its negative impact on wild stocks, which started coming to light in the late 1990s, has caused it to be a major cause of controversy. With the global human population increasing steadily and hunger confronting millions of people, food production is a pressing concern calling ideally for high quality, nutritious food in large quantities from a source that does not severely disrupt the environment. Aquaculture has generated considerable interest because fish and other aquatic organisms are generally very efficient converters of feedstuffs into high quality protein when compared to other farmed animals. For example, a catfish may require 6 kg of feed (wet weight to wet weight) to produce 1 kg of catfish whereas a chicken might require 10 kg and a pig 30 kg. This is possible primarily because aquatic species are cold-blooded (or more correctly, poikilothermic), and hence do not expend energy on heating, and because movement in the aquatic environment requires little energy. Fish and other aquatic organisms also tend to have a higher percentage of edible weight than terrestrial species. Aquaculture can produce large quantities of protein in a relatively small space, and recent developments in technology mean that the water can be filtered and re-used, providing more efficient use of water resources than the simple flow through systems. Furthermore, aquaculture can be easily integrated with other crops, particularly vegetable crops. In China and southeast Asia, rice farmers raise carp in their rice paddies. Outside rice growing areas, the fish wastewater, rich in nutrients, is excellent fertilizer that can be used for irrigation or as the nutrient-rich water for growing vegetables hydroponically. Furthermore, farming of high value (and often overexploited) species can reduce pressure on wild stocks, and even help in the replenishing of wild stocks. The simplest system for raising fish is in ponds or irrigation ditches. Juvenile fish or fingerlings are put into a pond and fed until they reach market size. The fish are caught, either by draining the pond or by using large nets. Food can be from natural sources—commonly zooplankton feeding on pelagic algae, or benthic animals, such crustaceans and mollusks. Tilapia species feed directly on phytoplankton, making higher production possible. There are a number of factors that determine the amount of fish that any given pond can produce. The first is the size of the pond, which determines the amount of water available for the fish, which in turn determines the amount of oxygen available for the fish. If there are too many fish in the pond, there will not be enough oxygen, and the fish will become stressed and begin to die. Another factor is the capacity of the pond to digest waste from the fish and the uneaten feed. The waste that is toxic to fish is mostly in the form of ammonia, nitrites, and nitrates. The pond environment provides natural ways to eliminate waste. For example, in one waste processing cascade, the initiating bacteria convert available ammonia to available nitrites, which a second bacteria converts to the available nitrates that plants and algae consume as a growth nutrient. The viable density of fish in a pond is determined by the balance between the amount of waste generated and natural processes for waste elimination. If the fish release too much waste into the pond, the natural processes cannot keep up and the fish will become stressed. Fish density can be increased if fresh water can be introduced to the pond to flush out wastes or if the pond can be aerated, either with compressed air or mechanically by using paddle wheels. Adding oxygen to the water not only increases the amount of oxygen in the water available for the fish, it also improves the processes involved in removing the wastes. Another factor affecting pond culture is predation from birds such as egrets and herons, and animals such as raccoons, otters, and even bears in some areas. If the pond is small, fences and overhead netting can control predation. When ponds are large, however, predation is very problematic. In some cases, farms have been ruined by bird predation. Another concern is algal blooms, which can lead to an exhaustion of nutrients, followed by a die-off of the algae, depletion of the oxygen, and pollution of the water, leading to a loss of fish. Advantages of pond culture include its simplicity, and relatively low labor requirements (apart from the harvesting of the fish). It also has low energy requirements. A major disadvantage is that the farm operation is more dependent on weather and other natural factors that are beyond the farmer’s control. Another disadvantage concerns the marketing of the fish. Generally, ponds are only harvested when most of the fish are at market size. This means the farmer has many fish to market at the same time, requiring a market that can absorb large quantities of fish at a time and still give a good price to the farmer. Usually this means there is a need for some kind of processing and large-scale marketing, with several fish farms in the same area to provide the processing plant with a constant supply of fish. If this kind of marketing infrastructure is not available, then it is difficult for the fish farmer. Cage-based aquaculture cultivates aquatic organisms by confining them in a cage within a body of water, which could be a pond, a river, or an estuary. In cage culture, the waste from the organisms and food they don't eat is passed to the receiving body of water with the expectation that natural processes will remove the waste from the water. In such systems, the grower needs achieve a balance between the density of aquatic organisms in each cage and the number of cages in the body of water and the amount of waste the body of water can absorb and still maintain acceptable water quality. The problem of pollution always occurs when too many fish are put in too little water, whether it is in a pond or a cage or several cages placed together in a larger water body. So long as the proper balance is maintained, however, pollution is not a problem. The farmer must then determine if that balance will provide enough production to be profitable. An advantage of the cage culture is that the farmer has more control over the fish and multiple harvests are possible with less labor. This allows for more marketing options when smaller quantities of fish are harvested over longer periods of time. For example, the farmer may be able to market his fish to local restaurants or fresh fish markets and therefore be able to command a better price for his fish. Another advantage is that the cages generally provide protection from most predators. The major disadvantage of pond culture is that the amount of fish the farm can produce is limited by the amount of waste the receiving water can absorb and digest. This in turn limits the growth potential of the farm. Another disadvantage is that the cages are vulnerable to storms, floods, and in some cases, winter ice. A flow-through system involves the movement of water through a series of raceways or tanks. The waste is flushed out of the system into a receiving body of water. In many cases, the raceways or tanks may simply be downstream of a diverted river or stream. This can be a simple system if there is a sufficient amount of clean water entering the system. The raceways or tanks give better control of the feeding and allow for better handling of the fish. It also is easier to grade or sort the fish by size. As with the cage system, the raceways make it possible to harvest and market fish over a longer period of time, which improves the farmers marketing position. Some farms have pumped well water instead of using streams or springs. The advantage of pumping from wells is that water purity can be controlled more easily and there is less chance for disease and parasites contaminating the fish. The major disadvantage of the flow-through system is the cost of pumping the large amount of water that is required. The optimum fish density for this system is limited by the flow rate of clean water and the amount of waste the receiving water can absorb while maintaining acceptable water quality. Two problems common to the pond, cage, and flow-through systems are that they all require a large amount of clean water, and the environment must absorb a large amount of waste. Since the 1960s, much research and experimentation has been done on recirculating systems. A recirculating system means that the aquatic organisms are grown in raceways or tanks and the waste is then removed from the water and the water re-used. Oxygen is added to the water at a constant rate by using compressed air or liquid oxygen, or via cascade flow. The recycling system uses natural processes to remove the waste, but confines and intensifies the processes in order to get more waste removed in less time and using less space. Mechanical filters such as settling tanks, pad filters, or rotating screens called drum filters remove the solid waste. Another type of filter is the biological filter. This filter removes ammonia and nitrite from the water, which come from the fish body waste. These two chemicals are particularly toxic to fish. The filter uses bacteria to digest the ammonia and nitrite, with the bacteria growing on surfaces inside the filter. The surface area is critical to the efficiency of the filter. The more surface area, the more bacteria and the more bacteria, the more waste that can be removed. The surface area is usually shredded plastic, plastic rings, or plastic beads. Plastic is usually used because it is durable and can be cleaned and re-used. The major advantage in this system is that large numbers of aquatic organisms can be raised in very little space and using a small amount of water. Another advantage is that the farmer can manage the organisms, the water quality, the water temperature, the feed rations, and the grading much more closely, especially if the tanks are in a building. This allows the farmer to plan for year round production, which is a strong marketing advantage. It also solves the predation problem and weather related problems. The problem of waste removal is easier to manage with a closed system. The waste can be totally removed from the system and spread on land as fertilizer, rather than dumped into a receiving body of water. A major disadvantage to recirculation systems is the capital cost to construct the system. A system that can produce 100,000 pounds of fish a year can cost up to US$500,000, not including the land or buildings. Another major problem is the energy cost to run the system, as well as the higher cost of fish food, which must contain a much higher level of protein (up to 60 percent) than, for example, cattle food, and a balanced amino acid composition as well. A third area of concern is disease and parasites. When fish densities are high, the risk of infections by parasites like fish lice; fungi (Saprolegnia ssp. ; intestinal worms, such as nematodes or trematodes; bacteria (e.g., Yersinia ssp, Pseudomonas ssp. ), and protozoa (such as Dinoflagellates) is much higher than in animal husbandry because of the ease in which pathogens can invade the fish body (e.g. by the gills). Once a system is infected, it is very difficult to purge the system. Most chemicals that will kill bacteria, viruses, and parasites will also kill fish, or will contaminate them and cause a problem when they are consumed. Salt can be effective in treating parasites in freshwater fish and there are a few other chemicals that are approved for use in treating fish disease. The best way is to prevent an infection by keeping the tanks and equipment clean and by being careful about introducing new organisms from other farms into the system. Other means to treat the water are being tried, including ultraviolet light and ozone. These treatments can be effective, but they are very expensive. This type of aquaculture requires tight monitoring and a high level of expertise. Salmonidae. Atlantic salmon (Salmo salar) and Rainbow trout (Oncorhynchus mykiss). Also smaller volumes of a variety of other salmonids. Originally developed in Norway, Denmark, and Scotland, now farmed in significant quantities in Europe, Canada, Chile, and Australia (Tasmania). Shrimp: Mostly Black tiger shrimp (Penaeus monodon) and increasingly White shrimp (Litopenaeus vannamei). Techniques originally developed in Japan and Taiwan. Mostly farmed through tropical and sub-tropical Asia and South America. Carp: European carp, Chinese carps (Grass, Silver and Black), and Indian major carps. Easily the largest global aquaculture industry by volume of production. Major producers are China, India, Southeast Asia, and Europe. Carps, which are herbivores, are major contributors of high quality protein to the diets of poorer people around the world, but their value in commercial markets is low. Seaweeds: Many species. Huge volumes, low economic value. Mostly farmed in Asia; particularly Japan, Korea, and China. Catfish: Major species are Vietnamese basa, Channel catfish, and African and Asian walking catfish (Clarias batrachus). Mostly farmed in Asia and the Southern United States. Tilapia: Nile tilapia and a few other species. An herbivorous species very well suited to subsistence farming, although arguably not well suited to large aquabusiness due to finicky breeding biology and low flesh recovery (although becoming a very successful import in the United States and Europe). Mostly farmed in Asia, South America, and Africa. Oysters: Pacific oyster (Crassostrea gigas), American oyster (Crassostrea virginica), Flat oyster (Ostrea edulis), and others. Mostly farmed in Asia, United States, Australia, New Zealand, and Europe. Flat oyster was once a huge industry and low cost/very high quality food for the masses in Europe, but collapsed under mortalities brought about by the parasite Bonamia. Mussels: Blue mussel (Mytilus edulis), Green mussels (Perna sp.) Mostly farmed in Europe, Asia, New Zealand, and South America. Tuna Southern Bluefin tuna, Northern Bluefin tuna. Tuna farming in Australia has had immense financial success. Tuna farming at present is really a fattening enterprise, where wild bred juvenile tuna are captured and grown in pens to a larger size and better flesh quality. Having the fish confined in pens also means that harvests can be timed to suit the market. This practice has resulted (at least in Australia) on reduced pressure on wild populations and a much larger value for their relatively small wild (Southern bluefin) tuna quota. Like other agriculture production, aquaculture must stand up to a rigorous evaluation of any environmental impact. For example, Salmon aquaculture has come under increasing scrutiny from environmental nongovernmental organizations (ENGOs). In Canada, salmon farming sites occupy a small portion of the coastal zone areas where they are located. The total area occupied by Canadian salmon farms in British Columbia and the Bay of Fundy in New Brunswick is less than 0.01 percent of the coastal area where these sites are located. Still, even though salmon farms occupy only a small percentage of the public waters, scientists have found a significant degradation of the areas where they exist, with lowered oxygen levels, replacement of native seaweeds with invasive seaweeds, increased algal blooms, reduction of wild species, and loss of nursery habitat for wild fish. Many farmed fish species are carnivorous, meaning that other wild fish species must be harvested in order to maintain the fish farm. For example, herring are used to make salmon feed. Since herring are the backbone of the North Atlantic food chain, increased fishing pressure on their numbers is a serious threat to all other fish species, and other species such as seals, that depend on herring for food. It is argued that fish farms, far from removing the pressure on wild fish stocks, increase it. Others argue that it takes less fish (in the form of the fishmeal component of an aquaculture diet) to produce a unit of table fish through aquaculture than through the natural food web. Fisheries that are based on species lower on the trophic web (such as many species used for fishmeal) are also more resistant to overfishing than typical table fish fisheries. The fish farm industry is trying to decrease its reliance on fish for fish feed. The vast majority of aquaculture production on the global scale involves omnivorous species such as carp, catfish, and tilapia), which can be raised on feeds using very little or no fishmeal. A portion of the fishmeal used in fish feeds for highly carnivorous species comes from the trimmings and discards of commercial species. More studies are being done concerning shifts in feed composition using poultry and vegetable oils as substitutes for fish protein and oil. However this use of land-based feed ingredients results in a decrease of the Omega 3 fish oils in the farmed fish (although in some cases a 'washing out' of the terrestrial oils can be achieved with a short period of feeding with marine oils prior to harvest). The current reluctance to further reduce fishmeal and marine oils in the commercial diets of species such as the salmonids and shrimps is based not so much on technical difficulties as on consumer resistance to the taste and health qualities of vegetarian fish. In the long term, alternative sources of long-chain Omega 3 fatty acids (the most difficult ingredient to acquire from non-fish sources) may be developed from zooplankton or microalgal origins. Other problems with aquaculture include the potential for increasing the spread of unwanted invasive species, as farmed species are often not native to the area in which they are being farmed. When these species escape, as tilapia has done in Florida due to flooding, they can compete with native species and damage ecosystems. Another problem is the spread of introduced parasites, pests, and diseases. While the negative impacts of some aquaculture on the environment have been widely publicized, the positive environmental effects of aquaculture are often overlooked. For example, many aquacultured species are highly sensitive to water quality conditions and aquaculture farmers often notice the effects of pollution or reductions in water quality before other authorities. Aquaculture businesses have a vested interest in clean waterways, in that a reduction in water quality has a direct effect on their production rates and financial profitability. Appropriate aquacultural development can serve as 'canaries' for the health of waterways, with farms often conducting very regular and quite sophisticated monitoring of their aquatic environment. Aquaculture seems to be developing is two different ways. One way is toward further development and spread of the large, highly technical farms—agrobusiness factory farms&mdas;capable of producing a million pounds of aquatic organisms each year. These farms specialize in cultivation and are able to process and market their own product. Although there is some debate about the quality of fish raised in such large systems, it is clear that these farms can produce ever larger volumes of fish. Globally, five companies own the great majority of these large farms. The second trend is toward further spread and development of networks of smaller farms requiring less technology and therefore less capital investment than the factory fish farms. These smaller farms tend to market their product locally or in cooperation with other small farmers. These farms raise a greater diversity of crops and they integrate fish farming with the other crops. The wastewater, for example, may be used to raise vegetables and other cash crops. The small farms have to rely on pumped water and may have to build marshes where the water can be purified naturally before being pumped back into the tanks or ponds. Much more work must be done in order to harmonize the intensive production of fish and the environment. Large-scale aquaculture is still a new and undeveloped industry when compared to terrestrial agriculture. Only a few species (some salmonoids, Pacific white shrimp, and possibly several species each of catfish, carp, and tilapia) are currently on their way to becoming true domesticated aquabuisiness species in the way that poultry, beef, and pork have long been. While the aquaculture industry is still only a small way into the development curve, the inherent biological characteristics of aquatic animals bode well for the future contribution of aquatic farming to living standards and the environment. Aquaculture has developed by trial and error for millennia, without causing the severe environmental impact so evident in the history of hunting and intensive agriculture. However, the art, science, and business of aquaculture is now at a crossroads. On the one hand, it offers great potential toward satisfying humanity's need for protein and helping economies of developing nations. However, its rapid growth and modernization also means that it may move toward intensive aquaculture, as we have seen in agriculture, with the potential for serious threats to aquatic systems. The quest for high profits could be accompanied by abuses, environmental and otherwise, which is why opposition is seen by some NGOs. It is important that well-balanced systems be developed that are sustainable. If done correctly, it offers a great potential to help humanity. The importance of aquaculture was recognized in 2005 with the awarding of the $250,000 World Food Prize, considered the Nobel Prize of food and agriculture, to an Indian scientist, Modadugu Gupta, for his work in aquaculture. Gupta created an inexpensive and ecologically sustainable system of fish farming that can be done on a small scale, using ditches and seasonally flooded water holes or small ponds. These small ponds produced protein and income for more than one million families in Southeast Asia and Africa, increasing freshwater fish production in some countries by three to five times. Many of those utilizing these systems are poor women and landless farmers, raising as few as two hundred fish, sometimes in narrow ponds along roadways filled with water in the rainy season. Food and Agricultural Organization of the United Nations, Aquaculture Steering Committee of the Fisheries Department. 1988. Definition of Aquaculture, Seventh Session of the Indo-Pacific Fisheries Council (IPFC) Working Party of Experts on Aquaculture. Bangkok, Thailand. Higginbotham J. 1997. Piscinae: Artificial Fishponds in Roman Italy. Chapel Hill, NC: University of North Carolina Press. Naylor, R.L., S.L. Williams, and D.R. Strong. 2001. “Aquaculture – A Gateway For Exotic Species.” Science 294: 1655-6. Parker, R. 1995. Aquaculture Science. Albany, NY: Delmar Publishers. The World Food Prize, About the Prize.worldfoodprize.org. Retrieved September 6, 2008. FAO FISHERIES TECHNICAL PAPER 408/1. PART II. POLICIES TO PROMOTE SUSTAINABLE COMMERCIAL AQUACULTURE fao.org. Retrieved August 10, 2007. This page was last modified on 9 April 2016, at 16:34.